In Hindu tales, Durga Mata, the mother goddess represents purity and strength. She carries the sword of truth, destroys demons, conquers ignorance and leads humans to enlightenment. Durga Mata will bring out your inner philosopher. This makes her a worthy after dinner smoke for an evening of deep conversation with friends. The buzz is potent and physically relaxing. The aroma is perfume like with a taste of Turkish fruit. 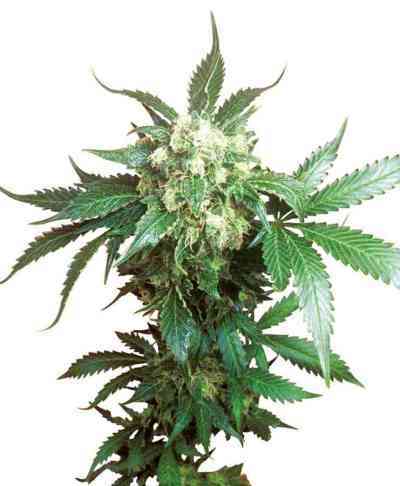 The medical qualities of this herb are highly appreciated by medical users for the longlasting relaxing effects. Durga Mata’s parents were selected for their high resin content and ease in growth and maintenance. The variety is reliable, homogeneous, with clone like results, which makes it perfect for a sea of green setup. The internode spacing is tight and the buds are dense, compact and she grows very uniformly. Durga Mata survives rough treatment and still performs very well, and has a natural resistance to pests, making this variety an excellent choice for starters and experienced growers alike. Qualified for breeding purposes!